We have some serious pickle aficionados in our family. My nephew Jonah is probably the most avid. Forget about ice cream and cake, the kid’s face lights up at the sight of pickles — and he reserves his sweetest smile for this sourest of tastes. I began to grow cucumbers every summer mostly to accommodate his voracious appetite. Together, we tracked down and tested any number of recipes, searching for the absolutely perfect pickle: bread and butter pickles, garlic pickles, half sour dills. It’s fun to pickle with kids, especially if you forgo the (cu)cumbersome — and potentially dangerous — hot bath portion of the exercise, and simply sterilize the jars by running them through the dishwasher a couple of times. Afterwards, store the homemade bounty in the refrigerator for up to three months (though, I promise you, it won’t last that long). There’s something immensely satisfying about stuffing a bunch of cucumbers into big shiny jars together with fistfuls of dill, garlic and onions … filling the jars to the brim with brine and a good sprinkling of pickling spices … making them rest in the refrigerator for at least 24 hours … then waking them up from their over-night sleep and — presto chango, like a frog that’s just been kissed — having them emerge from the jar as tasty, crunchy, real live pickles! In a large saucepan, bring water and garlic to a boil. Cook for 5 minutes. Add vinegar and salt, raise the heat to high, bringing to a boil, stirring until the salt dissolves. Remove from the heat. 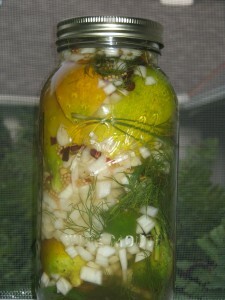 Using 8 1-quart glass jars, place 2-3 sprigs of fresh dill in each. Divide the seeds and peppercorns evenly between the jars. Using tongs, remove the garlic from the brine and divide it evenly among the 8 jars. 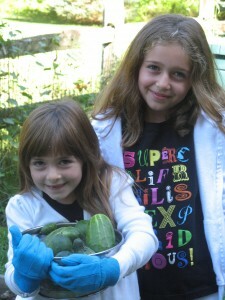 Then pack the jars full of the cucumbers. You want them to be tightly stuffed. Bring the brine back to a boil, pour it over the vegetables to cover completely, let cool, then cover and refrigerate. The pickles will taste good in a few hours, but even better after a couple of days if you can resist them! Pickles will keep in the fridge for about 3 months.